There are days that I would like to clone myself. If there were two of me, I could get things done twice as quickly and have more time to do what I enjoy doing. I'm pretty busy with my writing career as well as multiple speaking engagements during the year and my active full-time work in another field. Face it. Sometimes the work involved in caring for our companion animals isn’t any fun. My family had two cats when I was a child and I loathed cleaning out the litter box. Of course it was necessary, but when it came to “cat pan duty,” nobody wanted to do it. But it had to be done. And so it is with tidying their enclosures, changing their substrate paper, scrubbing food and water bowls and mopping the floor. But it’s a fact of life and it’s a part of keeping birds. Why make five trips when you can make one? My friend Shari has seven African Grey Parrots. That’s a lot of food and water bowls to be carrying back and forth to the kitchen to clean at least two or three times a day. And when Shari told me how she does it, I wanted to smack myself in the head for not thinking of it myself. How does she do it efficiently? Shari uses a tray to stack and carry the bowls into the kitchen in one trip in order to clean and refill them. It’s one trip for her instead of multiple trips back and forth. Rebecca Stockslager, owner of Noah’s Bird Nest, a bird supply store in Port Charlotte, Florida not only fosters birds for Florida Parrot Rescue, she boards birds for families that are on vacation or on business trips. She has anywhere from 15 to 25 birds under here care at any given time. Rebecca uses a 2-tiered cart with fresh water, food and newspaper that she rolls around her shop to ensure that her birds are fed, clean and have fresh water. She can get all of the birds looked after in a fraction of the time it would take if she didn’t employ the cart. Multitasking is an amazing timesaver. Lots of tasks to accomplish and little time to get it all done? Begin the jobs that require little attention first: Throw the load of laundry and assemble the casserole for dinner before tending to the birds cages or washing the floor. Cleaning the bathroom? Add cleanser to the toilet, sink and tub and let it sit to allow the cleaner to do its work and soak before actually scrubbing them. Spot cleaning parrot poop on the floor? Pre-treat with a bird safe cleaner and let it do its magic before attacking it with a microfiber cloth soaked in hot water. 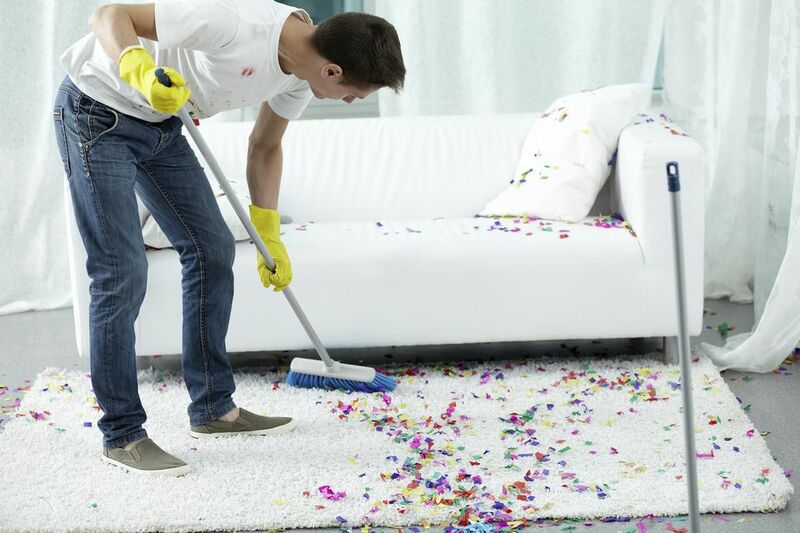 Want to keep that substrate of their house clean? Place newspaper on the bottom of the substrate and when you are removing this paper to replace it with clean paper, spritz it down with some water from a spray bottle. This will prevent dander from flying in the air when you remove it for replacement. I have become an avid list maker over the years. I’ve found that I need to write things down and prioritize my life in order to keep everything organized and get everything done when my life became more complicated. I keep a pen and a pad of paper in nearly every room in the house for those moments of inspiration or remember something that needs to be done. I’ve also taken to using the dictation feature on my cell phone to remember flashes of inspired ideas for article subjects as well as grocery lists and errands. Don’t just move them out of the way! Sing, hum or chat with them while you’re cleaning around their enclosures. Explain what you’re doing while they watch you. Ask them for encouragement and just have fun with them. These little moments of attention mean the world to them and engaging them while you work makes the job more fun. Anytime I’m doing something that is safe for one of my Greys, I try to include them. If I’m vacuuming, one of them gets to go for a ride on my shoulder while I’m working. If I have to go into another room for a an envelope, one of them goes with me. It’s a quick and easy way to provide attention and contact while you are accomplishing something else. If I am dishing up their meals in the evening, one is allowed into the kitchen to watch me prepare the bowls of food and fresh water. Use water in a spray bottle to lightly spray down papers before removing them from the cage and replacing This wets down the dust and dander, adhering it to the paper so the dust doesn't fly around. There are many ways to provide attention to your flock. And it doesn’t always have to be undivided attention. Simply being aware of them and including them in daily activities provides a closeness during that time that can be quite valuable. Working some of these methods into your daily routine might make life a little more streamlined.